2005 was a busy and very productive year, we managed to start and complete quite a few big projects, achieving far more than we originally set out to do in this 12 months. The Kindergarten school garden is being very productive; the cassava has been harvested and money has been made from the sale of some of it for the school funds. 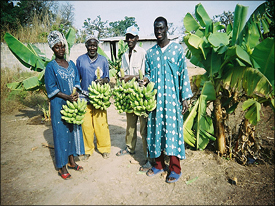 Also growing very well are the banana trees which are producing a lot of fruit, aubergines, pumpkin, butternut squash, okra, melon and potatoes. We replaced the wooden posts on the veranda of the school with concrete ones. A new school kitchen was built, with a storeroom to the side. We repaired two wells in the village, one had to be completely rebuilt. Further supplies were given to the Kindergarten, Toniataba Lower Basic School, and Pakalinding Upper Basic School. We sent two tonnes of supplies during 2005 in total. 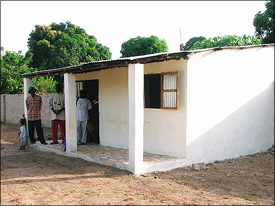 The Si-Kunda medical centre was completely renovated, and has tables, chairs and storage. We provided it with all the basic supplies it needs. Supplies of paper, pencils, pens, books and toys were been given to Fonkoi Kinda Lower Basic School, this village is approximately 10km from Si-Kunda. 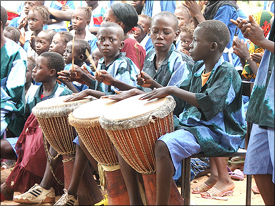 Providing three large African jembes (drums), recorders, tambourines, and clothing material for the drama group at Toniataba school enabled the group to perform concerts in and around the area which is raising funds for the school, and so far this has provided text books for the upper classes of the school. They really are very good, and they gave us another performance when we visited early November. 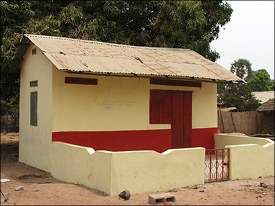 The library in Si-Kunda was been completed. There is now plenty of shelving, cupboards and benches for seating, with over 1000 books, and is proving to be very popular. A new generator was donated to the charity for Si-Kunda, which we shipped out in September, and in November the wiring was done to provide plenty of light in and around the mosque. Other uses will include providing light for evening meetings in the village. Continued sponsorship of our 3 schoolteachers and 2 caretakers / gardeners in Si-Kunda, and also our project manager in Gambia, Sankung. Continued sponsorship for over 30 schoolchildren. The Women’s Garden Project was started. The fencing is in progress and the ground being cleared. There will be allotments for 150 women. We are going to dig three wells, have a storeroom, and a seating area in a shady corner of the grounds. We hope to have the garden ready to use in the second quarter of next year. There is a lot to be done, so it is going to be a very busy time over the next few months!